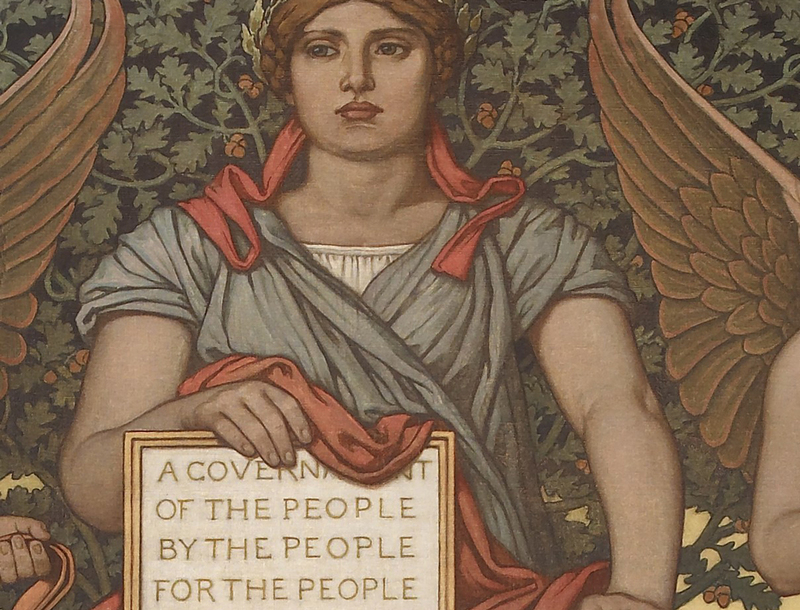 Detail of Elihu Vedder’s mural Government (1896), in the Library of Congress. Via. Power always thinks that it has a great soul and vast views…. And that it is doing God’s service when it is violating all His laws. Shall you reign because you enclose yourself in cedar? … Yet your eyes and your heart are for nothing but your covetousness, for shedding innocent blood, and practicing oppression and violence. What ten sentences have been more scriptural than the ones delivered by Abraham Lincoln in that southern Pennsylvanian killing field? Not just scriptural in rhetoric, with the president imitating the simple Anglo-Saxon vocabulary and the Hebraic parallelism of the King James Version of the Bible, but indeed quasi-scriptural in import to the American project. Lincoln’s words, chiseled on Union war monuments and memorized by generations of school children, should be more central in the American cannon than either the Declaration of Independence or the Constitution, both penned a bit more than a hundred miles to the east of where Lincoln would ultimately deliver his oration. That’s because whereas the Declaration contains the utopian promise of an America never realized, and the Constitution is a profoundly flawed, problematic, and anti-democratic document, the Gettysburg Address achieves a subtle union of the two, by interpreting the imperfect reality of the Constitution through the paradisiacal millennialism of the Declaration. In such a reading Lincoln’s address is as if Midrash for the scripture that is the Constitution and the Declaration, a type of secular exegesis that created fresh interpretations of canonical texts so as to create new, equitable political arrangements. This particular hermeneutic of Lincoln’s owed much to his conversations with Frederic Douglass, as sociologist Philip Gorski makes clear in his incomplete, yet illuminating, new book American Covenant: A History of Civil Religion from the Puritans to the Present. In Gorski’s formulation, Douglass’s reading of the “preamble of the Declaration, with its promise of equality, overrode the articles of the Constitution with their tacit recognition of chattel slavery,” and this was indeed the interpretation that Lincoln would express across some three odd minutes, and in only 272 words. Garry Wills’ account of the event is strikingly theological, writing that “Lincoln was here to clear the infected atmosphere of American history itself, tainted with official sins and inherited guilt. He would cleanse the Constitution… He altered the document from within, by appeal from its letter to the spirit.” Wills – prophetic-minded former Jesuit that he is – has a sense of the numinous about his depiction of the sixteenth president’s speech, an American Sermon on the Mount by an American Christ. For Wills – and of course in many ways for the idea of “America” itself – the Gettysburg Address heralded nothing less than its own self-declared “new birth of freedom.” Lincoln, in such an account, was as Moses on Sinai; the Gettysburg address departs from profane history, and into the sacred. Wills writes that Lincoln’s audience “walked off from those curving graves on the hillside, under a changed sky, into a different America.” A powerful theophany indeed, for Lincoln’s are some pretty well-penned words no doubt, but a changed sky over a different America? But then this is the charged essence of American civil religion. Civil religion – that amorphous, indeterminate, variable and yet powerful concept. A collection of symbols, national legends, and mythic narratives which function as a type of subconscious base for the aspirations of a nation – in particular of the United States. A land whose only true innovation to the liberal political order was neither separation of powers nor federalism, but rather the radical disestablishment of the churches (not to be confused with French laïcité). A land where that disestablishment of the churches not only resulted in a tremendous creative ferment for religion itself, but which also lent itself to the development of a type of shadow religion which took “America” itself as its focus, a religion which furthermore could be embraced across denominational lines and by those of no traditional faith at all. Civil religion’s holy sites are the Lincoln Memorial and Independence Hall, its scripture the Constitution and the Declaration of Independence, its theologians Lincoln and Martin Luther King, and its theology ostensibly one not about salvation, but rather liberty and equality. What variety of civil religion one embraces – pluralistic and tolerant, or rather a crude strict constructionist letter of the law theology – depends on what the definition of that ever malleable word “America” is. A referent and symbol as open ended and ambiguous as either utopia or Eden. He is an American, who, leaving behind him all his ancient prejudices and manners, receives new ones from the new mode of life he has embraced… Here individuals of all races are melted into a new race of man…. Americans are the western pilgrims. As a term “civil religion” can be traced back as far as to Jean-Jacques Rousseau in the eighteenth-century, but it gained a new academic import with the publication of the classic sociological text The Broken Covenant: American Civil Religion in Time of Trial (1975) by Robert N. Bellah, Gorski’s dissertation adviser at Berkeley. Bellah’s account of American religious culture traced the ways in which an implicit, in some sense subconscious, and invented faith, which took “America” itself as the central object of its devotion, had evolved “alongside of and rather clearly differentiated from the churches.” Bellah argued that this civil religion had its own scripture, in the form of not just the Declaration of Independence and the Constitution, but indeed political speeches such as Lincoln’s, that it had its own rituals ranging from patriotic holidays to the duties of civic republicanism itself, its own theology, and its own priesthood (of a sort). After all, a council of learned elders performing exegesis on an ancient document describes both the ancient Jewish Sanhedrin and the Supreme Court equally well. While American civil religion was in some sense indebted to its Christian and in particular Protestant roots, it is not reducible to them either. Central to the American civil religion, as both Bellah and his student Gorski would argue, is the Hebraic concept of the “covenant,” the creedal connection between the American people and the highest ideals of the nation. Bellah wrote of this covenant as a “founding myth,” and just as the Puritan sees the Old Testament typologically reflected in the New, and both cyclically embodied in present time, so have there been many founding myths of America, from Plymouth Rock to Philadelphia in 1776 and Gettysburg in 1864, the nation ever redefining itself while also recommitting itself in subsequent covenants – just as Noah, Abraham, and Moses had with their covenants. Exodus, in particular, has held a strong resonance in American typology, from the Puritan crossing the Atlantic to the escaped slave crossing the Ohio River, for as Gorski reminds us the Hebraic analogy “has been a seedbed, not only of most Western forms of nationalism, but also of revolutionary politics as well,” and what is the American project but simultaneously both a nationalist and revolutionary one? Myth of course is not history, the former has no concern with the factuality of events so much as with their “truth,” and as Bellah emphasized this “religious dimension” was implicit in “the life of every people, through which it interprets its historical experience in the light of transcendent reality.” As such, American civil religion is not a “religion” as popularly understood by that word’s strictest (and thus also inaccurate) definition, but in marrying providence to an almost numinous sense of ethics (for what could be more abstract than natural rights?) the American civil religion is most definitely a religion in the fullest sense of that word. One could assume that such a religion must be de facto reactionary, but one of the brilliant aspects of American civil religion is the way in which at its most successful it is supposed to have been able to meld together people of radically different backgrounds through shared ideals rather than appeals to race, ethnicity, language, or religion as conventionally defined – even if obviously the national history has itself been one of exclusion or inclusion at various points based on those very criteria. President Barack Obama, who Gorski correctly identifies as one of the most conversant of contemporary politicians in the rhetoric of civil religion, said that “Being an American is not a matter of blood or birth. It’s a matter of faith. It’s a matter of fidelity to the shared values we all hold so dear,” as apt a definition of the central essence of the idea behind American civil religion as anything more academic, especially because it gestures to a sort of transcendent faith as being the operating power of the ideology – even among ostensibly secular people. G.K. Chesterton, prefiguring Obama’s point, once claimed that America was the only nation founded on a creed, and the similarities between the ancient Hebrews bound together by covenant and the American people whose existence was similarly defined into being by textual fiat at a definite point in history was not one which was lost on the founding generation, when both Benjamin Franklin and Thomas Jefferson (among the most secular of the revolutionaries) advocated for a national seal depicting the story of the Hebrews’ exodus. The Philo-Semitism of the proposal was no mistake, since the Puritans errand into the wilderness Americans have often typologically conceptualized the nation as a type of New Israel, and as the ancient biblical kingdom was composed of a diversity of tribes so too the E Pluribus Unum of the United States – with progressives enlarging the bounds of definition for the American project over the centuries. For those on the left who (only recently) have blanched at the rhetoric of religion in public life, Gorski provides a template for how theology can still be a wellspring for progressive politics, as he reminds us that “Again and again, the covenant between the Israelites and their God was renegotiated, and each iteration was more socially inclusive and more ethically universal than the last. The historical development of America’s civil religion had followed a similar pattern.” And as Gorski argues, membership in the community only requires adherence to the covenant (a very different matter of fidelity than “assimilation”), in opposition to the noxious idolatries of religious nationalists, as he calls them, who fetishize matters of blood and background over the transcendent covenant itself. Remember, as well, that a covenant is different from a contract. A covenant entails the holding of both people and deity (or “Deity”) to their higher and shared ideals. Civil religion, in contrast to the religious nationalism of the literalists and fundamentalists, must be steadfastly introspective, its point is not to exult the nation no matter what it does, but to prophetically hold the nation accountable for its sins. Gorski writes that any civil religion which locates “evil outside of itself and claims certain knowledge of divine Providence quickly mutates into self-worship and self-benediction.” The best of the American civil religious tradition, from its ur-text John Winthrop’s 1620 “A Model of Christian Charity” through King’s speeches, avoids the validations of certainty, preferring rather to answer the prophetic injunction by holding Americans responsible for their continual backslidings, to “speak a truth that allows suffering to speak,” as Cornel West put it. The most popular genre of sermon in the second and third generation of Puritan New England was that of the jeremiad, based in the rhetoric of that prophetic book of the Old Testament in which Jeremiah holds Israel accountable for the numerous ways that the people and especially their rulers had violated the highest aspirations and ideals which defined the nation. From Puritans like Samuel Danforth and the Mathers in the seventeenth and eighteenth-centuries, all the way through Barack Obama’s “A More Perfect Union” speech in response to the Jeremiah Wright controversy (there is that prophet’s name again! ), the jeremiad has been the favored mode of American politics. At its crudest it’s a variation on the “Golden Age” myth which archetypally reoccurs in seemingly every culture – that there was an Eden and some snake made us lose that paradise. These primitive jeremiads, with their calls to make America great again, merely focus on perceived material plenty or the halcyon joys of cultural uniformity. They are a shell of a jeremiad, a pantomime of the form more than an example of it. Confederates and their Copperhead sympathizers (both in their earlier and current forms) easily conceptualized the golden age of what would become the mythic “Lost Cause.” Douglas wrote of the pro-slavery, antebellum churches of the nineteenth-century that they practiced “a religion which favors the rich against the poor; which exalts the proud about the humble; which divides mankind into two classes, tyrants and slaves; which says to the man in chains, stay there; and to the oppressor, oppress on,” still an accurate description of many evangelicals who’ve sold their soul to the Mammon of the Invisible Hand. Douglas (who I have heard is doing some tremendous work) says that we must rather commit ourselves to the mighty, ever-living God, who is always a “God of the oppressed,” and as such the true jeremiad calls the nation to account not for any loss of power or prestige, but for a violation of its principles. And, what are those principles? Few places better to return than that field in Pennsylvania, where Lincoln simply defined America as a “new nation, conceived in Liberty, and dedicated to the proposition that all men are created equal.” If those are the nation’s principles, than from Citizens United to Stephen Bannon in the White House we’ve fallen very short of our values, and have more need of genuine jeremiads now than at any point in our recent history. A nation dedicated to the proposition that all men are created equal lets the police martyr her black children while the majority of Americans platitudinously obscure murder by mouthing the jingle “All Lives Matter;” a nation conceived in Liberty splits families up through deportation, or closes the golden door shut to those who are Muslims; a government of the people, by the people, and for the people has increasingly become an oligarchy, replicating the worst iniquities of the Gilded Age. A broken covenant indeed. So, in the manner of the most scrupulous of Puritans (who after all are our intellectual ancestors), it’s worth performing that rigorous self-examination and asking “Whither the covenant now?” Bellah’s subtitle of course alluded to the breaking of that covenant in the era in which his book was written, published the year that Saigon fell. Optimistic, sunny evaluations of American exceptionalism had seemed to die in Southeast Asia alongside 60,000 Americans and close to two million Vietnamese. Much as the ancient Israelites continually fell short of their covenant, Bellah emphasized how the participants in the American covenant were also prone to backsliding, and how that covenant was spectacularly challenged at particular points in history, such as during the Revolution, the Civil War, or the period of Bellah’s own writing, which he termed America’s “third time of trial.” Well, it seems that the franchise is a tetralogy, for in this, our “Cold Civil War,” the American civil religion seems on the verge of collapse (as I’ve argued elsewhere), with ideological divisions as stark as they have been for the past half century, and with the Oval Office filled with arguably its most demagogic occupant, for whom despite all of his executive and legislative incompetence always seems as if he is only one national tragedy away from transforming himself into a full-on dictatorial tyrant. If there was ever any legitimacy to the model of American exceptionality which understood this country as “the last best hope of earth,” where King’s contention that the nation is exemplary because “America is the world in miniature and the world is America writ large,” than not even Richard Nixon posed as grave a threat to that revolutionary universalism as Donald Trump does, a man who categorically denies both Lincoln and King’s vision of the United States. One of Gorski’s most potent observations is in correctly identifying American civil religion’s moment of fallenness, when Ronald Reagan modified Winthrop’s beautiful, humble clarion call to conceive of the American experiment as being a “city on a hill” (itself a quotation from the Book of Matthew) with the gaudy adjective “shining.” Suddenly gone was the theological vision which understood our covenant as being one of “charity,” replaced with a libertarian, consumerist promise of purely material comforts. Gorski astutely describes Reagan’s theology as “Pelagian,” that is to say that the Gipper and his California optimism denied original sin, and in the process any sense of national or personal responsibility. Reagan was certainly more responsible for this type of selfish, naval-gazing individualism than the feel-good ‘60s flower power generation. Gorski writes that Reagan’s theology “left out the bitter salt that had given the prophetic stance its sting: the notion of collective sin. And therein lay one of Reagan’s greatest, least noted, and most fateful innovations.” In the rejection of any kind of understanding of national destiny which has ruthless self-castigation at its center, Reagan adopted the mantra of supply side economics, which advocated no ethic other than that of growth, consumption, wealth, and competition. For those who gnash their teeth over the Republican Party’s supposed cooption at the hands of vulgar Trumpians, take heart: the situation has always been terrible, now it’s just honest (if seeming to reach some sort of dark culmination). Reagan claimed that the city on a hill was shining, it’s only been recently that we’ve been able to make out that that luminescence was the cheap, tawdry electronic glow of an Atlantic City neon sign. But now that that malevolent geneology has become clear, we face another crisis forcing us to ask what responsibility does American civil religion now have with Caligula in the palace, demanding that all be rendered unto him? When the only God is Mammon, maybe especially the God of the evangelicals who sold whatever slight birthright they had for a mess of meager pottage doled out at the feet of a tyrant as foam-mouthed as any Nebuchadnezzar? As on cue, arriving right at this fourth time of trial is Gorski’s book, perhaps presciently published at our present moment, though conceived of in those comparatively sunnier days of 2008 (economic collapse aside) when Obama’s speech on race at the National Constitution Center inspired the sociologist to update his adviser’s thesis for a new millennium. The result, as I mentioned earlier, is incomplete – a book both important, welcome, and vital, but that is not quite as radical as it needs to be. Gorski’s thesis is that there are three major strands in American public life, his celebrated civil religion which has to contend for dominance alongside a fundamentalist religious nationalism (which interprets America in apocalyptic and specifically Christian terms) and a radical secularism which broaches no role for theological language in public life. As is perhaps the case with any sociological schema, Gorski’s tripartite division is a bit too reductionist, even if his overall description is legitimate. American Covenant suffers from a certain whataboutism. The author admirably writes about “the vital center,” a third-way charted between the two heretical traditions vying for dominance with civil religion, and he borrows the Anglican term of the via Media to describe this centrist moderation charting a course between the sword-and-flame obsessed eschatological religious nationalists and the radical secularists who apparently spend all their time complaining about “In God We Trust” being emblazoned on our currency. By contrast, Gorski’s via Media is depicted as a sort of estimably sober, sane, rational alternative to either extreme. The biggest theoretical difficulty in this endeavor lay in defining the admittedly complicated concept of “secularism,” and the project is diminished by not fully considering whether such a concept is actually intellectually impossible. Practically, “radical secularism” as a movement poses little threat to the health of the body politic, as rhetorically obnoxious and provincial as the so-called “New Atheists” might be. He defines radical secularism as a “noxious blend of cultural elitism and militant atheism that envisions the United States as part of an Enlightenment project threatened by the ignorant rubes who still cling to traditional religion,” continuing later by arguing that the ideology “fails because restricting religious expression violates liberal principles, because the United States was not founded on a ‘total separation’ of religion and politics.” Gorski’s account of radical secularism (whose origin he identifies with the Victorian legal thinker Robert Ingersoll) falls short in a few ways: it overstates the actual political threat which the movement poses, it irons out some historical counter-examples which are problematic for his argument, and while beginning to gesture to the proper analysis of secularism, it doesn’t fully interrogate the ways in which “radical secularism” (alongside any other political ideology) is simply a type of theology in disguise. No doubt Christopher Hitchens, Sam Harris, and most of all Richard Dawkins (alongside their cultish acolytes), were and are an insufferable lot – poorly educated on the topic of religion, anemic when it comes to theology and history, and nowhere near as clever as they imagine themselves to be. That being said, intellectual boorishness and genuine danger to the Republic are two different things, and the radical secularist agenda of Margaret Murray-like atheistic zealotry which Gorski writes about holds absolutely no real sway outside of a few tony zip codes. Maybe this is a bloc with outsized power in New Haven, or Cambridge, or Berkeley, or the Upper West Side, but the vast majority of the country doesn’t suffer from a surplus off too much secularism – far from it. His contention that the United States was not founded on a “total separation” of religion and politics is a bit of overly clever jiujutsu, for nobody credibly claims that the nation was to be founded on a total separation of religion and politics, but rather that of religion and state – otherwise how could I conceptualize my own political positions which involve adhering to Amos’ desire to see “justice roll down like waters, and righteousness like an ever-flowing stream” while using my well-worn ACLU membership card as a bookmark for that passage in my copy of the King James Bible? His argument that “Secular liberals who claim that the United States was built on Enlightenment foundation are just as mistaken as religious nationalists who believe that the American founders were ‘orthodox Christians’” is unassailable. When the left ignores the obvious, if heterodox, religious origins of American identity Gorski is absolutely correct that they’re as in error as their triumphalist evangelical adversaries. But the legal “separation of church and state” as implied by the establishment clause of the First Amendment is also a historical reality; it does Gorski’s argument no good to obscure evidence such as the diplomat Joel Barlow’s “Treaty of Tripoli,” unanimously ratified by Congress in 1796, which unequivocally stated that “the United States of America is not, in any sense, founded on the Christian religion.” Barlow, incidentally, appears nowhere in American Covenant. I don’t wish to impugn or simplify Gorski’s argument, he makes clear that “Civil religion recognizes the importance of an institutional separation between church and state,” yet he overstates both the dangers of radical secularism while simultaneously minimizing its intellectual geneology. When he writes that “it would be a good thing for the more secular minded to reflect on how their values are ultimately grounded in a certain ‘transcendent’ understanding of reality, that is, a reality that transcends their physical self and its narrow interests” I wholeheartedly and uncomplicatedly agree with him in his entirety. My academic criticisms are perhaps reducible to the “narcissism of small differences” as Freud famously put it, which I’ll admit is a common affliction, especially among academics, but I’d be remiss not to examine areas of disagreement I have with Gorski. What I should point out (without having the space to elaborate) is that I don’t believe there is anything secular about radical secularism, for the simple reason that I doubt whether secularism, beyond the necessary strict legal fiction of the establishment clause, is even possible. America is not, and never was a Christian nation, but its “secularism” (insomuch as such a thing is even possible), is really a variety of Protestant heresy which evolved into a new religion, taking the nation itself as the god of its supplication, and not incorrectly replacing Christ with an idea of a utopian “America” of charged possibility. Gorski, I think believes something similar about secularism: that it’s not possible to be devoid of all religion, evident when he approvingly quotes the novelist David Foster Wallace’s argument that “there is no such thing as not worshipping. Everybody worships. The only choice we get is what to worship.” Something very similar was said by that other American prophet, Bob Dylan, when he sang “it may be the devil or it may be the Lord, /But you’re gonna have to serve somebody.” The importance of Gorski’s book is that it begins the conversation about the ways in which progressives could reclaim scriptural language and theological thought in the service of a radical agenda. As such I don’t want an anodyne via Media, but a radical religious left, of civil religion in the service of what I’ve called elsewhere “the Augustinian left.” Perhaps it’s a difference of rhetoric, but the via Media of the vital center doesn’t move me, nor do the relatively tame prescriptions which Gorski tries to offer at the end of his book. Removing the commercialism from civic holidays, promoting character education in public schools, and advocating for universal national service are all fine and good, but none of those things would have necessarily prevented the moment we find ourselves in now – redemption requires stronger stuff. In Gorski’s defense he also clearly understands this, writing about the civil rights movement, the last major left-wing political movement with any theological core, that it “brought together a diverse coalition of social reformers that bridged long-standing divides of race and religion as well as the growing chasm between the religious and secular world-views – the sort of coalition that is needed today to remedy the deepening inequality and cultural malaise of our own era.” That the best suggestions for a revitalized version of progressive civil religion rely on proposals for better civics classes and national service isn’t to speak ill of the quality of those proposals, but it is to note just how silent our current generation is of prophetic voices that once thundered down from the prodigious hilltops of New Hampshire, and the mighty mountains of New York, and the heightening Alleghenies of Pennsylvania (not to speak of Stone Mountain, Georgia or Lookout Mountain, Tennessee). There is no Martin Luther King in America today, and to our profound detriment. For if we’re to be practioners of a prophetic republicanism than we must be willing to listen to prophets! In America today the worst are once again the ones full of passionate intensity, maybe we need a bit of that fire and light as well, to speak in prophetic tongues. Civics class is great and important, but when Canaan is turning into Babylon it requires the fortitude to identify a sin for a sin – and the malignant faux religion of Trumpism is nothing if not sinful. That finally is the most important observation of Gorski’s – that theological thought and scriptural rhetoric can be used for progressive politics, whether Gorski’s liberalism or something further to the left (perhaps even more for the latter). He’s absolutely correct in noting that for the past generation the left has been largely practicing an anemic politics devoid of any sense of sacred justice. It’s not that liberal proposals are necessarily wrong – though I’d appreciate less neoliberalism and more New Deal. But it’s also that the Democratic Party has confronted the profound injustices of the New Gilded Age with the language of policy papers when what the age requires is the rhetoric of the revival meeting; it’s that DNC leadership exhibits all of the cool rationality of the seminar room when the era necessitates the passion of the prophet; it’s that campus liberals are conversant in the jargony weak sauce of cultural studies privlege talk when they’d be better served looking at structural racism, misogyny, homophobia, and classism and calling them exactly what they all are: injustices and sins. As a fundamental truth, religious rhetoric and theological language remains the most potent method of critique against systems of oppression, far more than anemic cultural studies terminology as filtered through social media. W.E.B. DuBois identified a similar problem a century ago, when he wrote that “religion of mere reason and morality will not alone supply the dynamics of spiritual inspiration and sacrifice.” The ever baroque vocabulary of privlege and intersectionality and entitlement and so on has accomplished many necessary and admirable things, but by itself it must ultimately trend towards an emptiness, for such talk cannot on its own supply the inspiration and sacrifice that DuBois spoke of. Gorski says as much when he astutely observes that without scriptural language “Civic poetry would be transformed into political doggerel.” There is no Gettysburg Address without the Bible, and we need not literally believe in the later to know that it is what fuels the former. Contemporary politics remains the continuation of religion by other means, and make no mistake that Trumpism is nothing if not its own dark, occult faith. And what benefit is there then to the left returning to an awareness of its theological origins? The question raises something so much bigger than whatever our own personal faith or doubts may be, or even if questions of theology themselves make any literal sense. But, in our current political moment, I think a beginning might be approached by acknowledging that basic truth as conveyed in the ancient religious formulation which reminds us that “Resistance to tyrants is obedience to God.” Any valid emancipatory politics and attendant theology must always flow from that principle, and it is paradoxically true regardless of whether or not there is a literal God. The rest is simply commentary. Ed Simon is a senior editor at The Marginalia Review of Books, a channel of The Los Angeles Review of Books. A regular contributor at several different sites, he holds a PhD in English from Lehigh University, and is an expert on seventeenth-century religion and literature. He can be followed at his website, or on Twitter @WithEdSimon. In 1637, Mary Dyer of Boston gave a monstrous birth and its midwife was Anne Hutchinson. Both were Puritans of-a-kind: Hutchinson the notorious advocate of the so-called “covenant of free grace,” she of the antinomian controversy.